As a Baptist Health employee, you’re generous, caring and compassionate. Your dedication to providing quality healthcare is demonstrated in the work you do each day. 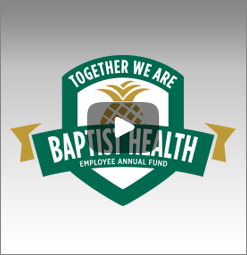 By joining the Team Pineapple Employee Annual Fund and making a gift to Baptist Health Foundation, you further your commitment to ensure that Baptist Health patients, employees and their families, receive the most advanced healthcare and support. Enhancing various patient- and family-centered care programs and facilities. Supporting clinical excellence and innovation. No donation is too small and you may designate your gift to go toward any one of over 30 funds. Copyright © 2015 Baptist Health South Florida. All Rights Reserved.